Another sterling performance by SA5 as they march up the table. Bowling first, MCC restricted Bedfordview to 158/6 in their allotted 40 overs. Aadil superb with the new ball,taking 2/17 in his 8 overs.Consistent great pace by Aadil has been a highlight of the season thus far,always keeping the openers honest, and getting a good start with the ball. 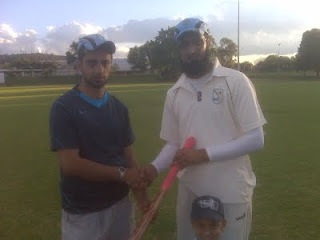 On the batting side, Moosa Patel hit some form with a splendid 48, and the match concluded with another man of the match performance by Farhad scoring 50 not out. The captain was stern towards his players after the game however. Too many wides,batsman throwing their wickets away at crucial times, and some indiscipline creeping into play.The team though is improving as a unit. A winning culture instilled in the players as well.There is a chance for league glory this season. All players got to pull their weight and rise during crucial fixtures, and the results I am sure, will speak for themselves.